When it comes to the holidays, I enjoy dressing up. But, for Thanksgiving? I like to relax a bit since I know I'll indulge with food. That's one of the top reasons Thanksgiving is my favorite holiday. I didn't grow up with traditional foods for Thanksgiving but, my husband sure did. He looks forward to certain things every year we're with his family. Turkey. Ham. Mac n' cheese. Collard greens. Banana pudding with Nilla Wafers. I have no doubt this year's food will be like other years we've spent with his family. So, I'm definitely going to prepare myself. I'll likely be in a variation of this look and on the couch in a food coma watching football. Absolutely love this! Those gray pants offset the structured look for a really cool vibe! I wish you two a fabulous Thanksgiving! The food sounds awesome! Love your outfit Nancy! I do love all the yummy food for Thanksgiving. I didn't grow up with it either and my mom just recently started eating turkey. Enjoy your Thanksgiving! Thats a lovely jacket you are wearing. Love how you made those joggers so cool & edgy!! Wishing you a wonderful Thanksgiving!! sweatpants is the new skinny it seems! you look great :) love how you styled it! 110% agree! I've been wearing leggings these past few days. I hope you had a great Thanksgiving! 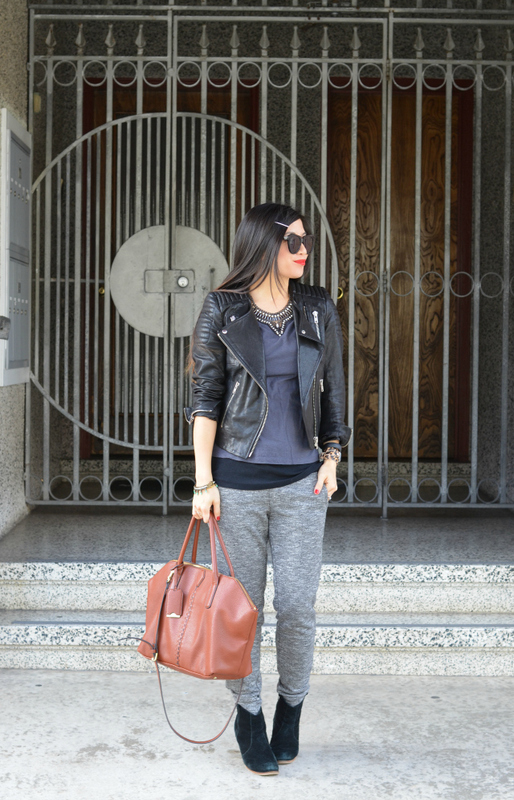 Love the joggers with the leather jacket! Great outfit!